It’s always hard to incorporate healthy vegetables into a meal. Here are some of my favorite Chinese vegetable recipes. These are great served with a main entrée and some white or fried rice. Searching for a different and flavorful salad to serve with dinner? Try this delicious broccoli and tomato salad. The combination of flavors and textures are sure to please everyone! Trying to get your family to eat more vegetables? Try this simple and delicious baby corn and bamboo stir fry. Baby corn nuggets and sliced bamboo tossed in a spicy and flavorful sauce makes the perfect side dish that the whole family will love. Looking for a delicious vegetarian side dish that is super easy to make? Try this delicious and healthy bok choy with sweet chili sauce recipe. The light sweet flavor and crispness of the bok choy is sure to please anyone. Searching for a delicious side dish? Try this broccoli with garlic sauce recipe. Broccoli cooked until it is just crisp-tender and then tossed in a flavorful garlic sauce makes a great side dish to serve with almost any meal. Searching for a different and delicious side dish for your next barbeque? Try this delectable coleslaw salad. It has the perfect blend of sweet and sour, crunch and spice! Are you looking for a healthy snack or side dish? Try this delicious stir fried eggplant. It is low calorie, very filling, and very tasty! Searching for a simple and delicious meal for breakfast, lunch, or dinner? Try this amazing egg foo young recipe. It's delicious at anytime of the day! Want a great side dish recipe? This garlic string bean stir fry makes the perfect accompaniment to any meal. Fresh string beans tossed in a flavorful mix of garlic, ginger and soy sauce are sure to please the whole family. Searching for a healthy and delicious egg foo young recipe? Normally egg foo young is fried using quite a bit of oil. This healthy egg foo young recipe uses cooking spray and combines egg whites with a delicious mix of vegetables that is sure to please anyone. Are you looking for a healthy, easy and delicious new recipe? Try this wonderful vegetable stir fry. It is fresh, flavorful and good for you! Do you love spicy food? Try this delicious spicy bok choy side dish. It´s both flavorful and healthy! In search of a great side dish? Try this mushroom and bean sprout stir fry recipe. It combines the flavors of woody mushrooms, green onion, garlic and cilantro which make a great side dish to accompany almost any meal. Have a love of mushrooms? Then you will love this mushrooms stir fry. Fresh shiitake and oyster mushrooms tossed in a fragrant and flavorful sauce are sure to please any mushroom lover. Searching for a healthy stir fry recipe? Try this amazing shiitake and bean curd stir fry. Tossed in a simple sauce of broth and oyster sauce he flavors and textures in this dish balance perfectly. Need a great side dish to make your meal complete? Try this delicious ginger snow pea recipe. This simple stir fry combines snow peas, fresh ginger, and soy sauce to create a tasty side that will complement almost any main dish. Looking for a great summer side dish? Try this delicious spicy bean sprout salad. It is perfect for any outdoor barbeque or cocktail party. Searching for a side dish to spice up your dinner tonight? Try this delicious spicy mushroom stir fry recipe. It pairs perfectly with grilled or roasted chicken. Green beans stir fried with almonds, garlic, and ginger make the perfect side dish for almost any meal. Having trouble getting your family to eat their vegetables? Try this amazing spinach stir fry. It makes a healthy and delicious side dish that everyone will love! Searching for a great side dish to go along with that perfect meal? Try this amazing bean salad. It's light, fresh, and makes a perfect summer dinner accompaniment! Searching for a great side dish? Try this Szechuan eggplant stir fry. 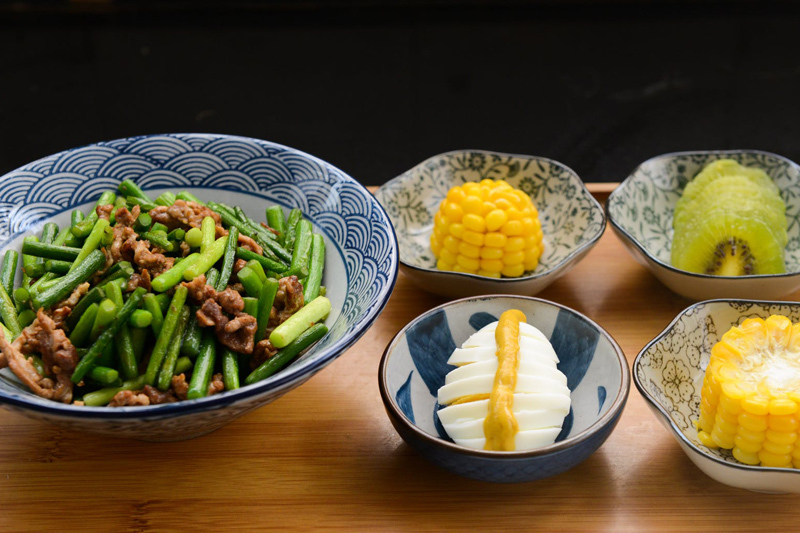 It combines the flavors of green onion, garlic and ginger that are spiced with hot bean paste and balanced with just a hint of sweetness. Do you love green beans? Try this amazing Szechuan green bean recipe. This recipe combines the flavors of Szechuan peppercorns, dried chili peppers, green onion, garlic, and ginger to make an wonderful tasty side dish.